Some of my projects come to me all at once but sometimes they evolve over time. 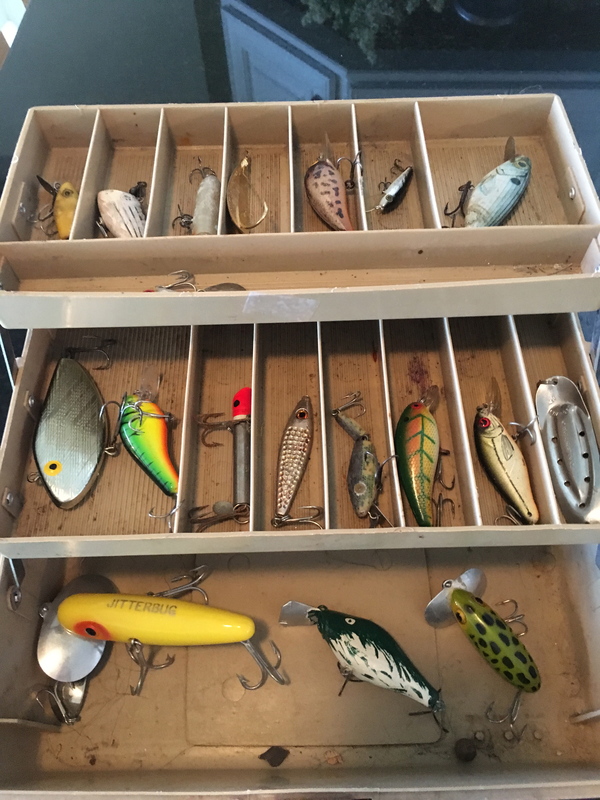 Recently while out shopping I found an old tackle box filled with vintage fishing lures. The box and lures were $30 but they were also 30% off. Sold! I brought the box to the lake house unsure how I was going to use the lures. Since my husband and I are not big into fishing, I thought they would be better served as decorations! I thought they might be cute made into key chains, but then I hated to take off the old hooks. I looked on Pinterest and found my inspiration! Someone had taken fishing hooks and lures and attached them to a lamp shade. I actually had the perfect shade to use! I bought this little lamp table a few years ago. It didn’t have a lamp shade so I added a wire lamp shade frame. (it was already missing the fabric) Since space is limited, I liked how the lack of a fabric shade made it easy to see through and didn’t block the view of the fireplace. Originally I was going to add some crystals to the lamp shade but I think the lures are the perfect “crystals” for this lamp! I hung all of the lures around the top at first but I like them better along the bottom. Each one looks like a little piece of jewelry. I love this! Once in a while a fishing lure will wash up on the sea wall. Now I can add them to the lamp! Naturally this wouldn’t be a safe option when my future grandchildren come to visit, but for now its unique and fun! I think my fisherman lamps fellows would approve!